(Nanowerk Spotlight) Optical imaging of nanoscale objects, whether it is based on scattering or fluorescence, is a challenging task due to reduced detection signal-to-noise-ratio and contrast at sub-wavelength dimensions. While advances in light microscopy have led to techniques that can image individual nanoparticles, these methods rely on relatively sophisticated and expensive microscopy systems. In new work, a research group led by Aydogan Ozcan, a professor in the Electrical and Bioengineering Department at UCLA and Associate Director of the California NanoSystems Institute (CNSI), created a field-portable fluorescence microscopy platform installed on a smartphone for imaging of individual nanoparticles as well as viruses using a light-weight and compact opto-mechanical attachment to the existing camera module of the cellphone. 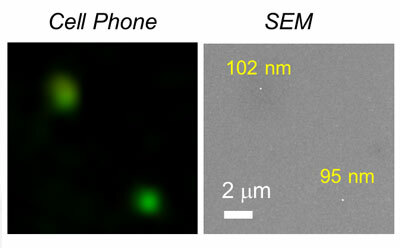 The results, reported in the September 9, 2013, online edition of ACS Nano ("Fluorescent Imaging of Single Nanoparticles and Viruses on a Smart Phone"), constitute the first time that single nanoparticles and viruses have been detected using a cellphone based field-portable imaging system. "Our field-portable fluorescent imager smartphone attachment involves a compact laser diode based excitation at 445 nm that illuminates the sample plane at a high incidence angle; a long-pass thin film interference filter; an external low numerical aperture lens; and a coarse mechanical translation stage for focusing and depth adjustment," Ozcan describes the design to Nanowerk. "The oblique illumination light on the sample plane is by and large missed by the low numerical aperture of the external collection lens and only the scattered excitation beam needs to be blocked through the long-pass filter, creating a very efficient background rejection mechanism that is necessary to isolate the extremely weak fluorescent signal arising from individual nanoparticles or viruses." He points out that the same imaging system is also useful for reducing the alignment sensitivity to depth of field, such that a coarse mechanical translation stage would be sufficient to focus the cellphone microscope to the sample plane even in field conditions. 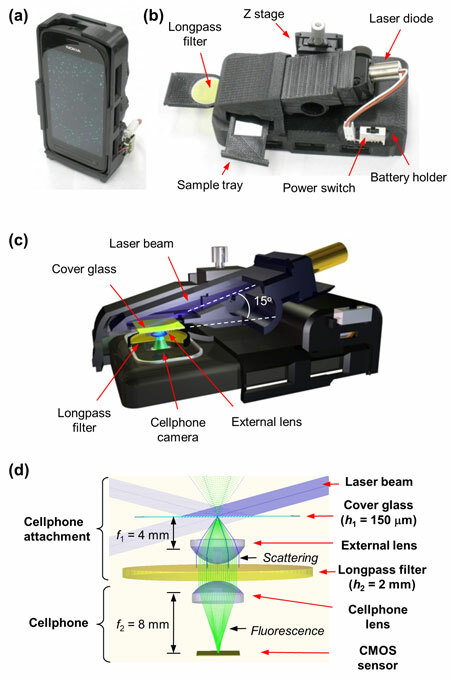 The team tested the performance of their smartphone microscope by detecting individual 100 nm fluorescent particles as well as single human cytomegaloviruses that are fluorescently labeled. "These results constitute the first time that a cell-phone-based field-portable imaging platform has been able to detect single viruses or deeply subwavelength objects," says Ozcan. "We believe that the new imaging performance reached through this work would provide a complementary addition to various other smartphone-based microscopy, sensing, and diagnostics tools, which might provide new opportunities in telemedicine and point-of-care applications, among others." Specifically, this field-portable fluorescence microscopy attachment – weighing only 186 grams – could be used for sensitive imaging of sub-wavelength objects including various bacteria and viruses, and therefore could provide a valuable platform for nanotechnology researchers in field settings and for conducting e.g., viral load measurements and other biomedical tests even in remote and resource limited environments. This research together with some other cellphone based micro-analysis techniques are being commercialized by a start-up company that Ozcan founded: Holomic LLC. Holomic will be showcasing some of these technologies in the Phase II completion of the Nokia Sensing X Challenge at the end of this month.